At its meeting on July 6, the TTC board accepted the staff recommendation that the access route to Ashbridges Bay Maintenance & Storage Facility remain on Leslie Street. The presentations accompanying the discussion were more extensive than those in the online version and I have reproduced selected pages below. My deputation to the meeting argued that the TTC should keep open the Knox/Russell routing option in case problems with the Leslie option are even worse than are now known. Several others appeared in support of various options and alternatives. Neighbouring businesses and residents on Leslie are generally opposed, while Canada Post maintains its strong dislike of the Knox route. 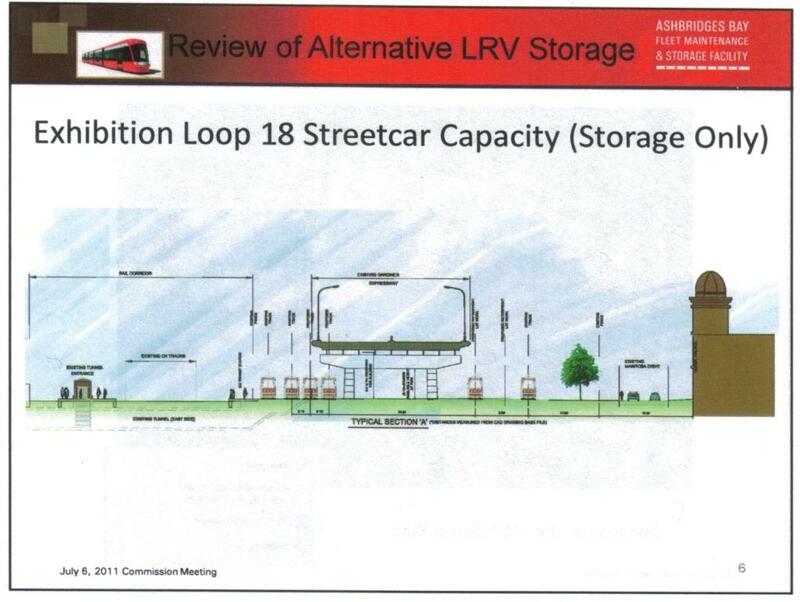 A study of alternative sites for LRV storage was originally launched through Councillor McMahon’s office. McMahon’s ward runs east from Leslie and contains the carhouse site, while Councillor Fletcher’s ward runs west. Both have been involved in community activism regarding this project. The study’s authors presented their report as an independent piece of work no longer formally associated with McMahon. The nub of their claim is that the TTC could store a substantial number of new cars at its Hillcrest and Exhibition Loop sites thereby eliminating the need for the Ashbridges project. TTC staff dismiss these proposals because (a) building under the Gardiner Expressway is not considered practical (headroom) and (b) the space available at Hillcrest is not economic. Although the proposed layout at Hillcrest would allow all of the St. Clair and part of the Bathurst service to be operated from a location much closer to the route, the saving in “dead head” mileage does not offset the cost of operating an additional carhouse requiring its own staff. Overall, the proposal for alternate sites only works financially if Ashbridges Bay can be completely eliminated. I suspect that if the TTC really wanted to, they would present at least the Hillcrest option in a more favourable light. Indeed, if the fleet of new cars expands to serve the waterfront, additional carhouse space will be required, and the Hillcrest site will be back on the table. TTC Diagram of CNE Loop showing two additional storage tracks just north of the Gardiner Expressway structure (view looking east). 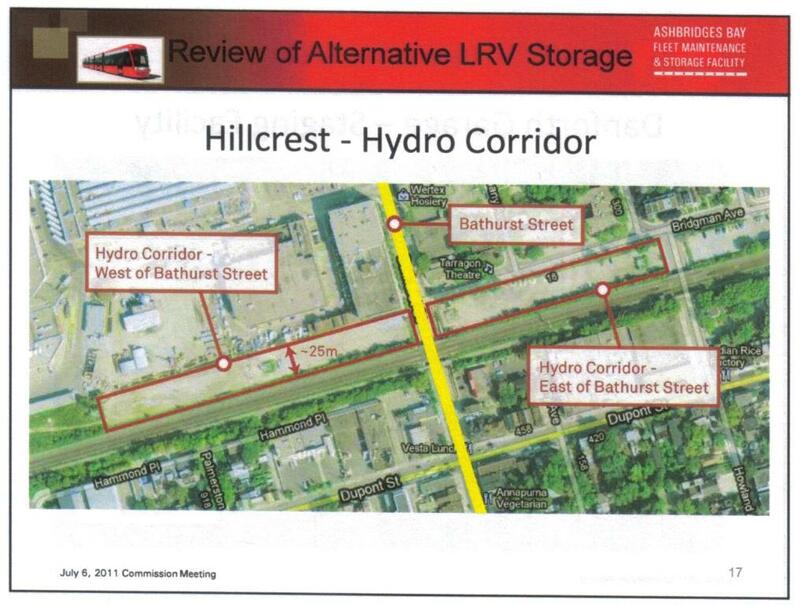 TTC Diagrams of Hillcrest Complex showing existing land use and proposed arrangement for LRV storage and servicing. TTC Diagram of Hillcrest Complex showing Hydro lands. As discussed in the report, this site is impractical because of problems of placing TTC storage directly under a Hydro line. Canada Post argues that the flow of trucks through their site is west to east, entering via Knox to indoor bays, and leaving Woodfield at the other end of their site. However, if this is true, then the postal traffic on Knox during the peak period for streetcar movement (5-7 am) is southbound, while the streetcars would be travelling northbound. This is precisely the argument used for the Leslie route — although there would be many streetcars leaving the carhouse to build up service, the traffic northbound on Leslie is very light, and the main demand is southbound. Therefore, the two can co-exist. A proper study would have documented the actual details of traffic flows and whether there was a true conflict, but none has ever been done. The TTC managed to find improvements in the Knox route including a revised layout at Russell Carhouse. The change here from the original scheme is that only two existing storage tracks, rather than three, are lost to the north-south connection, and the property requirement at Queen has changed from full taking of a building near the exit to an easement across the corner of the property. The comparison of options has also been updated from the original one in the EA to a new version for this report. Notable are changes in the cost estimate. Leslie goes up a lot thanks to the utility work required, while Knox goes up mainly due to escalation through delay to the project, and the present value of future operating costs. The qualitative evaluation for Knox has gone from “mid-range” on Access, Parking and Property to “worse” thanks to the property taking at Knox and Eastern (vacant land that is part of the street boulevard) with no allowance for the lesser requirement at the northwest corner of Russell Carhouse. Transit and Traffic operations for Knox have been upgraded from “worse” to “mid-range” because of the widening from 2 to 4 lanes. Reference to Noise being “worse” for Knox does not take into account the adjacent land use which is largely vacant or industrial. While I agree that the Leslie option would be the better one in a greenfield site, or even on the street as it was two decades ago, times have changed. The sad lesson of this exercise is that the TTC’s original evaluation of alternatives was not as accurate or fair as it could have been, and this triggered the obvious conclusion that they had no interest in changing from their initial, preferred scheme. 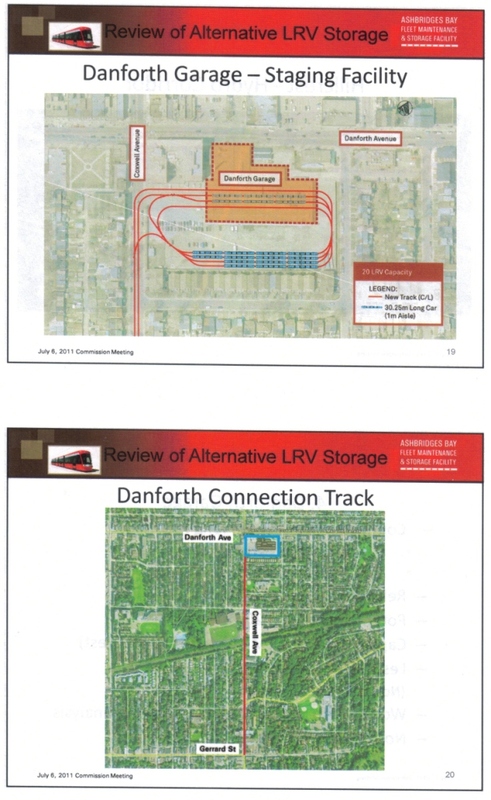 The question of a connection track from Queen Street to the new LRV maintenance facility at Leslie and Lake Shore will come before the TTC board again on July 6, 2011. Although the selection of this location was a matter of some controversy, that debate is over, and site preparation work is now underway. However, the route linking the new shops and yard to the existing system remained at issue along with questions about the suitability of alternate yards. At its February 2, 2011 meeting the Commission directed staff to review alternate routes to the carhouse and work with Councillor Paula Fletcher whose ward lies to the west of Leslie Street. I have participated in this process at the Councillor’s invitation. The TTC’s preferred route from a junction at Queen and Leslie south to Commissioners’ Street and into the site at its southwest corner. The Knox alternative was not part of the original Transit Project Assessment but evaluation of it was added at the end of the process in 2010 when this issue was before Council. At that time, the estimated costs of the two options were about 10% apart with Knox being the cheaper of the two. Other considerations tipped the balance in favour of Leslie Street, and that is what Council approved. Recently, the TTC has learned that the existing utilities under Leslie Street are much more extensive than originally thought, and that the cost and complexity of relocating them will be higher. Leslie is a main utility corridor, and it includes a 70-80 year old main connection to the Ashbridges Bay treatment plant. At one meeting, TTC staff were concerned that the limited space available under Leslie and the complexity of utility relocations could make the Leslie route too difficult to build. This is not reflected in the published report. The original review of Knox in 2010 triggered an objection from Canada Post whose South Central facility lies between Knox and Woodfield (a long block to the east). Canada Post claims that operation of a large volume of streetcar traffic to and from the carhouse via Knox would interfere with their operation. However, there has not been any traffic study to support this claim, and the main trailer yard for Canada Post is at the east (Woodfield) end of the site, not at Knox street. My own observation of Knox (in a previous article) showed that traffic to and from Canada Post via this street is low. In the revised design, the TTC proposes to widen Knox to a full four-lane road using property already owned by the City along the street. This would provide added capacity for Canada Post, although they are still unhappy with the scheme. This can only be resolved by a proper traffic study, something we are unlikely to see on short notice. Additional crossings of cycling trails along Lake Shore would be created, and one of these would be less than ideal for cyclists’ safety. Additional time would be needed for streetcars to enter and leave service. Compounded over the extended lifespan of the carhouse, this would add to the effective cost of the Knox option. A new crossing of Lake Shore would be added just east of the Leslie Street intersection. A change in the route would delay construction by requiring an amendment of the Transit Project Assessment. Regardless of which route is chosen, the TTC must operate a large number of streetcars out of the Ashbridge site during a fairly short period to build up service at the beginning of the day. Similar problems exist at other times (such as the ends of the peak periods), but they are not as severe because fewer cars enter or leave service during these periods. The number of car movements may exceed the capacity of the streets and intersections causing both transit delays and interference with other traffic. Once the new LRV fleet is in operation, 75% of the fleet will be concentrated in the east end of the system at Russell and Ashbridge carhouses. This inbalance will add to the running time overall of building service up and down compared with the existing arrangement where roughly half of the fleet is at Roncesvalles and half at Russell. If the fleet were dispersed to another location, this could both reduce the traffic effects of loading service at Ashbridge and reduce dead-heading costs of cars travelling long distances to their routes. Original plans for Russell Carhouse included expansion of the building for a major collision repair facility. This plan has been dropped, but the capacity represented by it does not appear to have been added back into the yard. One track in Russell yard is reserved for “run around” operations so that cars can be moved within the site. The function of this track could be included in the new connection to Queen releasing its capacity for storage. Storage of some cars at the Hillcrest site where there is a large parking lot and the former Davenport Garage. Storage of some cars along the Hydro right of way on the south edge of the Hillcrest site. Storage of some cars at a yard to be added to Exhibition Loop under the Gardiner Expressway. Any new yard will require at least office facility where operators can report for work and service can be dispatched. Moreover, cars stored there must have at least minimal running maintenance performed such as cleaning, and the site must be secure. Exhibition Loop was dropped from consideration because it does not have room for a servicing facility. 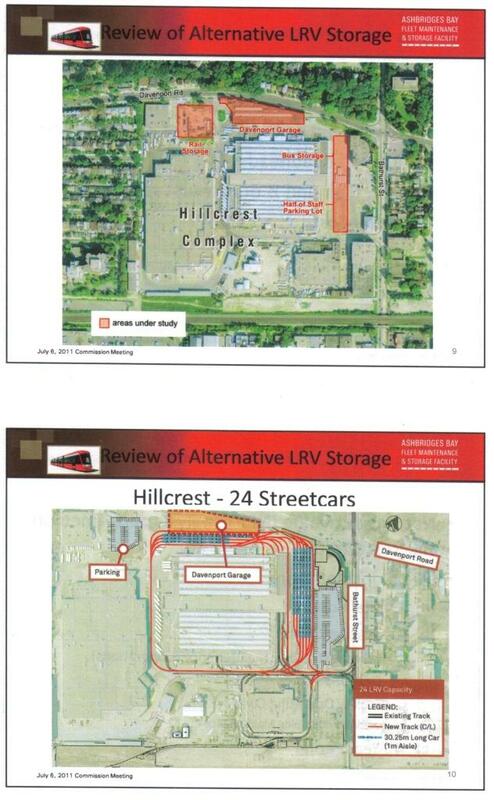 At Hillcrest, 24 cars could be stored and serviced using land in the existing parking lot and Davenport Garage (see diagram in the report). Although this would reduce the capacity required at Ashbridge and shorten dead-head times for some routes, the TTC argues that the life cycle cost for this arrangement would still be considerably higher than concentrating the fleet at Ashbridge. Use of the Hydro corridor lands is not recommended because of electrical interference, the cost of burying Hydro’s plant, and the added cost of a property lease. The statement about interference begs the more general question of the use of Hydro corridors for transit operations, but this is not addressed in the report. Reactivation of Danforth Garage as a carhouse was also reviewed, but this option was rejected on cost grounds. Unlike Hillcrest, Danforth is not connected to the existing network and would require a track connection on Coxwell of roughly equal length to the Leslie connection at Ashbridge. What is physically involved in relocation of the utilities on Leslie Street, how will this be accomplished, and what will be the effects on the neighbourhood to complete this work? Comparable construction planning and staging information is also needed for the Knox option. What is the real traffic situation with respect to Canada Post? Observing their actual operations is a simple, if tedious, process, but we need real numbers, not claims that appear to misrepresent how the site actually operates. What are the traffic operation implications of the Knox and Leslie options compared with each other? 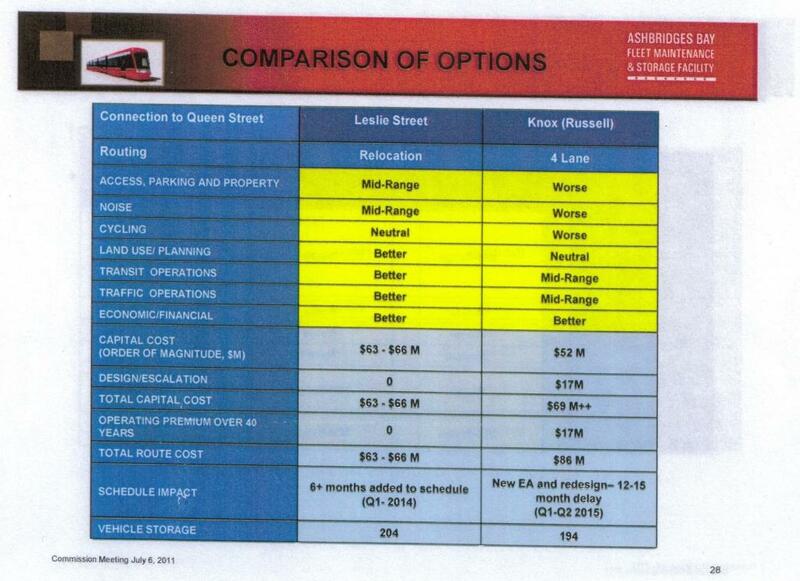 The TTC focuses on the alleged shortcomings of the Knox alternative, but does not present the offsetting benefits of staying off of Leslie Street. Community and traffic effects, both during construction and for eventual operation, have never been contrasted. Whatever benefits there may be by leaving Leslie Street “as is”, these are never shown as part of the overall evaluation. My underlying desire in this entire debate is that the Ashbridge project not be delayed. Sadly, the TTC has not helped the situation by giving the impression that alternative schemes and sites were given only superficial consideration, and that the “fix was in” for the Ashbridge/Leslie combination from the beginning. The new LRV project and the general renovation of the streetcar system have taken far too long, and the anti-streetcar politicians at City Hall will use any excuse to halt this work. The appearance of a design foul-up coupled with community opposition is a dangerous mixture, and the TTC needs to do everything it can to show co-operation and openness in this debate. There will be a community meeting on this issue on Tuesday, July 5, 2011 at Leslieville Public School, 254 Leslie Street (north of Dundas) at 6:30 pm. TTC Chair Karen Stintz and I have both been invited to speak. The TTC report on Knox suggests that switching away from Leslie could result in a delay of more than a year for th Ashbridges project, which is already on a tight schedule. Surely Paula Fletcher realizes such a delay could jeopardize the order and thus the future of downtown transit, right? How ironic it would be for such a staunch lefty to play into the hands of the streetcar-hating Fords. Goes to show that NIMBYism is a much stronger force than left-right ideology in TO. I just came across this summary of the capital budget process earlier this year. …which suggests Ford and co were not AWARE of the TTC awarding the contract to begin site prep at Ashbridges and were very angry after the fact. This seems astonishing, but there you go. I am about as paranoid as you are with regards to the renewal of the fleet, and obviously work continues and the yard and cars remain in the TTC budget for 2012. But are you aware of any rumblings from the Mayor’s office about some attempt at cancellation? Steve: It would be hard for the Mayor not to know about the contract award considering that the Commission is packed with Ford supporters, and someone from Ford’s office is always in the room. The award went through the Commission in spite of many deputations from the community about looking at alternatives. Yes, most definitely this was known to Ford, and any attempt to pretend otherwise is just Ford playing both sides of the street. That said, the TTC continues to give him opportunities to spike the entire process of streetcar renewal by their ham-fisted handling of many streetcar-related issues. I’m starting to get the impression that the TTC was a little too quick to dismiss the Coxwell-Lakeshore access route even though it was the most expensive option. Has anyone taken into consideration the serious problem that would be created by concentrating too many cars at one end of the city? Aside from deadheading costs and delays what about a Hydro failure wherein no cars could get out of the barn to run any service? If some cars are kept at Hillcrest etc. this would spread things out and reduce the loss of cars entering service. Here is a crazy thought. How about converting the unused Vincent subway yard into a streetcar facility? How many cars would it handle? 50? I still think the old Lever Bros. plant is worth a closer look and scrap Ashbridges Bay. Steve: The TTC plans to use Vincent Yard for BD subway capacity expansion. It can hold 8 trains. I don’t want to become a Hamish Wilson manqué endlessly promoting my preferred option, but nobody at all seems to have considered removing the vestige of bike path on the south side of Lake Shore, which isn’t part of the actual Martin Goodman trail, and running streetcars bidirectionally on that strip, turning up Coxwell onto Queen or Gerrard or both. Coxwell is a wide boulevard with barely any residences between Lake Shore and Queen (in practice, a single TCHC building that’s falling apart). I don’t have any sympathy for concerns about added travel time, since a few minutes here and there are trivial compared to, say, running in a Spadina car. And as I always like to point out, the spectacle of cars and brand-new streetcars whizzing past Lake Shore would be futuristic in the extreme and would add to the appeal. Oh, those “streetcar-hating Fords.” What about that cyclist-, jogger-, and rollerblader-hating Munro? Sorry, just a bit of cheeky humour on my part, Steve! But, honestly, the Knox alignment will ruin the best stretch of the Martin Goodman Trail in the east end of the city as well as its slightly lesser used companion to the north, Bike Trail #4. That said, most of us, I would think, would not expect the City to start re-industrializing the trail by bisecting it with streetcar tracks when it put in so much effort, barely a decade ago, to make it attractive after the demolition of the eastern segment of Gardiner Expressway. Yes, Torontonians have always headed to Ashbridge’s Bay for fun, but the trails’ popularity really exploded after the Expressway’s demolition. Prior to that, most of the “non-car” traffic headed for Harbourfront rather than the decaying east end. Perception is everything after all. It doesn’t matter if most of the streetcar movements will be in the early morning and in the late evening. A number of people won’t go anymore because the TTC will have broken up a trail that was great, and safe, to coast through at all hours of the day. Cyclists, and rollerbladers, whether novice or experienced, have to live with streetcar tracks on many main streets. But, at the end of the day, for all of the increased risk of injury due to the tracks, ambulance-chasing lawyers really aren’t making that much money off of us. We shouldn’t be adding streetcar tracks to heavily used recreational trails though. The trails are easily more heavily used by non-cars than Leslie Street. The TTC, in my view as a transit proponent, is making the right decision by sticking to a Leslie Street alignment, even if it understated the cost of utility relocation. Steve: Just to be clear, the streetcar tracks will still cross the trails, only at a different point than they would with the Leslie alignment. This has been portrayed by the TTC in a way that sounds as if it is a net new crossing, but it is not. In the Leslie alignment, the streetcars would leave the carhouse at Commissioners and Leslie and run north to Queen. This will cross the trail on the east side of Leslie at Commissioners, and it will cross both the north and south side Lake Shore bike paths at the Lake Shore and Leslie intersection. With the Knox option, there are only two crossing, both on Lake Shore east of Leslie opposite the foot of Knox Street. The TTC’s concern is that the south side crossing will involve tracks turning across the path rather than a 90 degree junction, and this creates a less safe arrangement. There were discussions some time ago about a special pavement treatment to make the cycling crossings safer, but this didn’t go anywhere. Everyone was so focused on the Knox option and its issues that they lost track, so to speak, of design issues for Leslie Street. As for that hater of things on wheels, Munro, I cannot help noticing that too many cycling advocates gloss over the issues for pedestrians, both from ill-mannered cyclists and from the basic fact that a cycling lane and pedestrians can’t mix due to their difference in speeds. Most transit users are pedestrians, not cyclists. Is it not possible to simply dig a tunnel under the Martin-Goodman trail((s?) There’s one on the north side of the road and one on the south side…), on the Knox option? 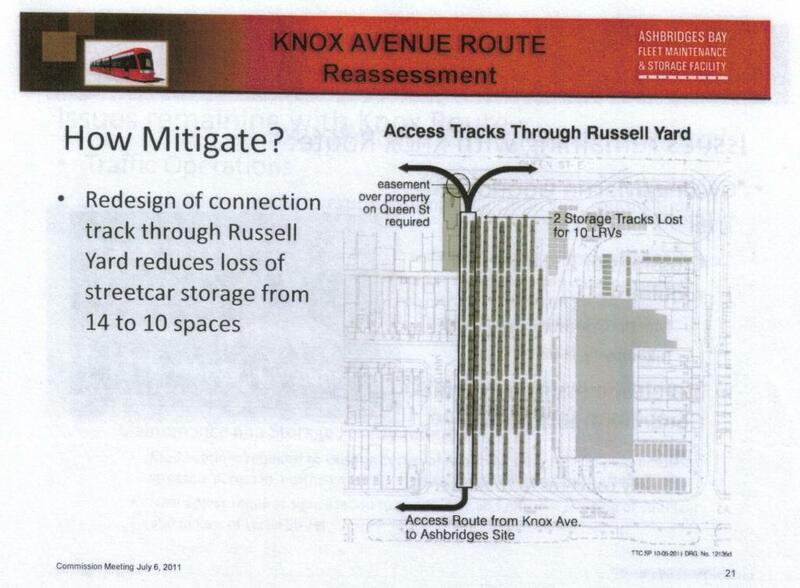 After all, the Knox option ensures a greater connection to the already exiting Russell Carouse, so I really think if we just put one part of the tracks underground to go under the trail, we’ll have no problem. Also I’m a transit rider and a cyclist. Steve: A tunnel would require approach ramps on either side. To the south, this would eat up a goodly chunk of the carhouse property, and to the north, this would dominate the (widened) Knox roadway. Look at the ramps at St. Clair West Station, a structure which is very close to the surface, for a sense of the scale involved. Moreover, a tunnel across Lake Shore would have to deal with any existing utilities, or go low enough to clear them. This is a very expensive way to get across the street, and the cost would blow the Knox option completely out of the water. With respect, that’s a fine piece of deflection that you’ve written in response to my comment. Under the Leslie Street and Commissioners alignment, streetcars will enter the yard at, or basically adjacent to, an already well-used City of Toronto driveway that all recreational users have always had to be mindful of because it existed before the trail itself came into being. That’s a very different scenario than adding tracks to a segment of the trail that, at present, is not even bisected by a two lane road. As for the Leslie and Lake Shore intersection, yes, it’s true that everyone — including even the pedestrians — will now have to navigate streetcar tracks. Will it make the intersection any less safe? No. Nobody is racing (or running) across that intersection unless they are travelling a car. The Gardiner is gone, but Leslie and Lake Shore is still a major intersection. Again, your comparison does not hold water. And, incidentally, there is an accompanying sidewalk that runs alongside the length of Recreational Trail #4 that prevents most, but not all, of the conflicts that you’re alluding to from even occurring in this area of the city. I’ve read, and posted, on your website for years. More than that, I have a few decades of following TTC developments under my belt now too. I largely agree with your positions, but I’ll have to make an exception this time. The TTC is correct to proceed with the Leslie Street alignment which, as indicated by its report, is the most likely outcome of this week’s Commissioners’ meeting. By the way, “Most transit users are pedestrians, not cyclists” is a great line. Of course, it means next to nothing in the context of my original comment. And, correct me if I’m wrong, but most transit users are Torontonians. Steve: The point I was trying to make is that the issue isn’t as black and white as you paint it. I agree with the TTC that the Leslie route, if there were not so many problems with it, is the most logical, the best route to Queen. However, it may not be practical when the complexity of the utility relocations is fully understood. As for the “most transit users” line, my beef is with the cycling advocacy community some of whom are in danger of alienating their most logical allies in attempts to rein in use of road space by cars. This is not really an issue at Ashbridge Carhouse, but in many other parts of the city. Cyclists must co-exist with pedestrians, just as motorists must co-exist with cyclists. Tunnelling in any way will add greatly to the cost, and I’m not so sure how high the water table is there, but the first thought I had when I read that was, what about tunnelling the Martin-Goodman trail under the streetcar tracks? It strikes me that one would not have to go as far down as the necessary vertical clearance would be somewhat less than for an LRV and its overhead wiring, plus the approach ramps for the trail could be somewhat steeper for the trail than for a rail line. I understand the arguments against a tunnel, but considering how busy traffic already is along Lake Shore in the morning, there’s one more reason to tunnel under both the bike trails and the boulevard. How much green-light time is going to be taken away from Lake Shore drivers due to all the streetcar crossings in the mornings? Steve: A great deal of the service is already out on the street before the peak period hits on Lake Shore. Most of the peak service is on the street by 7 am, well before the rush hour traffic into downtown. Streetcars are frequently short turned on their last trip before returning to the carhouse to get the operator off-shift as close to the scheduled time as possible. Are we going to see a mass disappearance of service in the west end at certain times of day if a higher percentage of the fleet is being housed in the east end? Driving westbound on Lakeshore in the morning at Leslie – much of the congestion seems to be because of the relatively short cycle time on the green traffic lights westbound – which I’ve always assumed was a deliberate attempt to restrict the number of cars that were getting on the westbound Gardiner, to keep it flowing better. As such, having streetcars in the intersection, really wouldn’t influence Lakeshore much. And as everyone keeps pointing out … most of the streetcar movements are before 7 AM. At 7 AM, there is no congestion eastbound. It starts appearing 10 to 15 minutes after that. I think this option was raised early in the planning stages, but can’t something involving Commissioners Road and Cherry Street be done, or is this too early to determine the ultimate build-out for this corridor in the redeveloped lands? Not only would this provide a more direct, likely more reliable access to downtown (as well as providing an alternative to Queen) but over time the corridor will likely be a backbone for development of the Portlands. Combine this with a connection via Coxwell and Lake Shore (the later in a private ROW) and you can put to rest those problems with all of the Leslie St. NIMBY’s. Steve: Redevelopment of the Port Lands is very far in the future, and a prebuild of the connection to Ashbridge would be a very hard sell. It would also require that the eastern waterfront LRT line, which isn’t funded yet, be built in the next two years. That’s far too much to prebuild just for an alternate route to the carhouse. John’s posting regarding this carhouse project being the “cannon fodder” to get rid of the streetcars has gotten me thinking. What would it take to do so? Politically, the Fords’ have stacked the TTC but what would council’s role in this be? I seem to recall that when this subject was discussed earlier that there would not be the support needed to get this passed. Back in the day, when we thought we could rest easy on this matter, I believe that Streetcars for Toronto had council passing a motion telling the TTC to keep the streetcars. Then there is the matter of cancelling the contract with Bombardier. While they may be amenable to going easy on the city if they order subway cars for Sheppard instead, that is far from a done deal. Since there is no money committed to doing anything on the line itself it could be seen as being somewhat premature to commit the city to buy the cars needed to run it. It would also open up the whole matter of Gunn’s rant about Toronto’s transit in general. I think that this would leave the Fords open to the whole Sheppard Subway debate all over again but this time with someone who has some credibility that the Fords themselves would have reinforced. It could also force the debate on the Downtown Relief Line. Then there are the operational issues. The Fords may run roughshod over them but they would now be in clear focus as someone would ask about the operating costs and advantages of buses versus streetcars. I know that the left would not let this matter rest. I also know I don’t have to tell you this, but the most frustrating thing about this is that we could be fighting to save the streetcars all over again. But, if so, please sign me up. Regarding the reactivation of the Danforth carhouse, was there any consideration of potential issues with the Coxwell railway underpass or was the whole thing basically just an idea tossed out there at this point? Steve: The capacity of Danforth plus its cost ruled out any further review. As for the underpass, it had streetcars using this route until early 1966. That said, with the escalation of costs with the two preferred options, was there any talk at the meeting of reevaluating the previously rejected track route options? 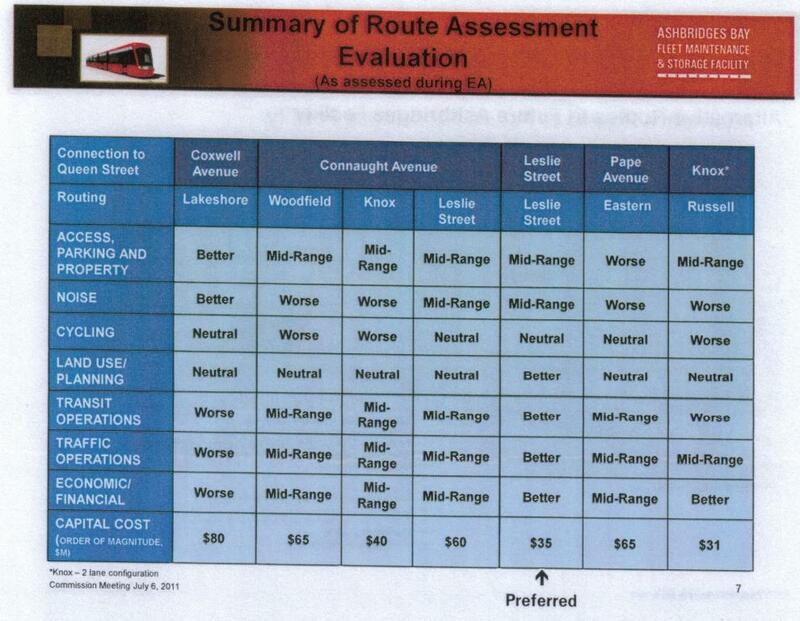 Looking at the original EA, it’s getting to the point where it wouldn’t take that much of a further increase in costs for Leslie and Knox for even the Lakeshore-Coxwell route to be worth a second look. Steve: It was quite clear that the TTC has no intention of re-evaluating the other routes. Has anyone considered using tracks next to Lakeshore Blvd turning up Coxwell Ave. connecting at Queen St. In the future these tracks could be used if a route was developed along Commissioner St. to get downtown a lot quicker than travelling along Queen or King. Steve: This was one of the options considered, but it was rejected for two reasons. First, it is one of the longest of the routes from the existing network to the carhouse. Second, there are times when the area is badly blocked by traffic from events at the lake front, and this could interfere with getting cars into or out of service. Looks like the Leslie Street option is about to be carved in stone. Any updates as to how much more work and money the Leslie Street option would entail? Steve: Leslie Street has always been the TTC’s preferred route from the carhouse to Queen Street, although the complexity of actually building it has risen as they discover what’s actually underneath the roadway. All of that was supposed to be included in the last estimate for the project that was sitting in the $450m range. What consideration, if any, has been given to the future requirement for the connection track? The Leslie track will only last so-long. Presently, the existing yards have redundant entrances/exits which allow for reconstruction of entrances while maintaining access to the yard. As I understand it, there is not sufficient capacity within the existing facilities to store the entire fleet for an extended period of time, and access would be essential for fleet maintenance. It would seem appropriate to me that consideration be given to the longer term implementation of a redundant connection with the yard that could be integrated into future transit routes, given that it will likely be needed within 20 years for reconstruction of Leslie. Also, the TTC/City of Toronto’s websites have not budged since late February. Do you know what’s going on behind the scenes with this project at the moment? Steve: The detailed design of the Leslie Street reconstruction is a matter of some debate between the TTC and local community which is still in progress. There is some major utility work (moving a high voltage hydro line, and moving/replacing an ancient wooden watermain (yes wooden!) both of which conflict with the new track connection. As for the future, an alternate connection may eventually come west through the Port Lands via Commissioners Street at the southwest corner of the site.